What Are the Benefits of Sushi? Packed with fresh fish, crunchy vegetables and fiber-filled rice, sushi can be a nutrient-packed, healthy meal. One wrong step, however, can add an abundance of fat, calories or sodium. Learn the ins and outs of what makes a healthy sushi roll to ensure that your Japanese meal stays on the right path. 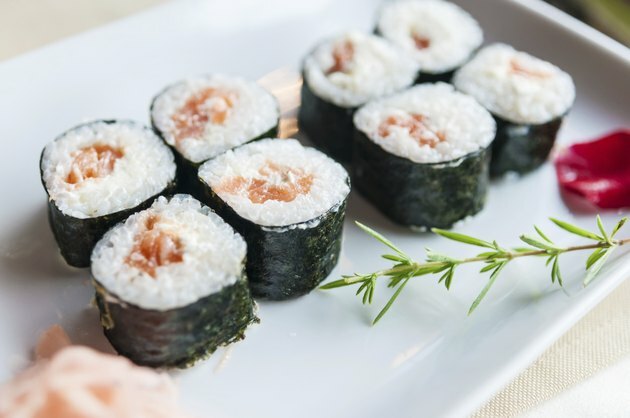 Some traditional sushi rolls made with raw fish, vegetables, rice and nori -- which is a type of seaweed -- are low in calories. For example, a salmon cucumber roll contains just 231 calories and 4 grams of fat, while a mackerel roll has about the same calorie count with only 2 grams of fat. A shrimp roll provides 199 calories and 0 grams of fat. To make the calories you consume even lower, start subtracting ingredients. Remove the fish to make a veggie roll to bring the calorie count down to 170. A piece of sashimi, which nixes the rice, is only 35 calories, when you prepare it with tuna. Avoid tempura, or fried sushi, as well as spicy sauces made with mayonnaise, as they both increase the calories. The outer wrap of sushi rolls, nori is a staple in Japanese cuisine, and for good reason. It’s very low in calories but is plentiful in nutrients such as vitamins A, B-6 and C, as well as in minerals like iodine. Additionally, a 2011 review published in the “Journal of Agricultural and Food Chemistry” concluded that the proteins in seaweed could reduce blood pressure and improve heart health. Much of the nutritional impact of sushi comes from the fish or seafood in the roll. Nutrition author Carol Ann Rinzler notes in “Shape” magazine that salmon and tuna are both healthy options because they’re high in protein, omega-3 fatty acids and vitamin D. Mackerel is also rich in omega-3s, as is selenium, which is a mineral that might help protect against cancer, according to “Shape.” Sushi does not have to contain fish; it can be made with any type of seafood. Other nutritious options for fillings include shrimp, scallops and eel. To boost your intake of nutrients, look for sushi rolls that contain vegetables as well as seafood. Some rolls, such as the California roll, include avocado, which is a source of healthy fat. To increase your intake of fiber, ask for sushi made with brown rice instead of white rice, and don’t forget the condiments that come with sushi. Spicy wasabi contains antioxidants and pickled ginger is an antimicrobial and antiviral agent. Skip the soy sauce, though, as it’s loaded with sodium. Sushi has its benefits, but certain types of fish can contain too much mercury. Consuming too much mercury can cause problems with vision, memory, headaches and hair loss. The Food and Drug Administration recommends shying away from shark, swordfish, king mackerel and tilefish, due to mercury content, and sticking to shrimp, salmon, pollock and catfish. Tuna, a sushi staple, has moderate levels of mercury. The FDA recommends keeping your fish-centric meals to no more than 12 ounces a week. NBC News: Is It Safe to Eat Sushi? How Many Calories Are in a Salmon Avocado Roll?